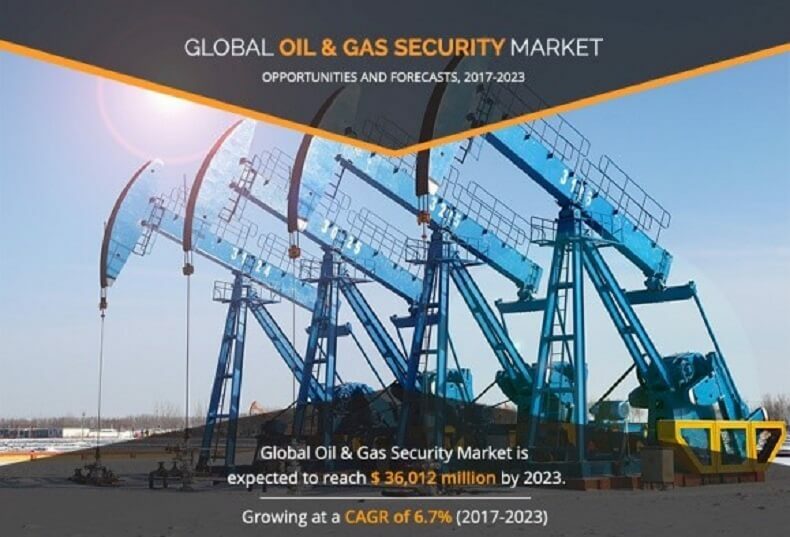 The Oil & Gas Security Market was valued at $ 23,141 million in 2016, and is projected to reach $36,012 million by 2023, growing at a CAGR of 6.7% from 2017 to 2023. The security of the operational technology (OT) such as supervisory control and data acquisition (SCADA) and distributed control system (DCS) of the infrastructure of the oil & gas industry from cyber-attacks and data theft is known as oil & gas security. The increase in cyber-attacks on the OT of oil & gas companies increases the requirement for security in the market. The protection from various cyber threats and data security breaches are the major advantages. However, huge capital cost and the constant demand for security upgrade are the disadvantages of the system. Prominent players profiled in the study are Cisco Systems, Inc., Siemens AG, Symantec Corporation, Honeywell Corporation, Inc., Corporation, Intel Corporation, General Electric, Microsoft Corporation, ABB Ltd., and Lockheed Martin Corporation. Company overview, business performance, strategic moves and developments, and other key points are provided for the aforementioned companies. 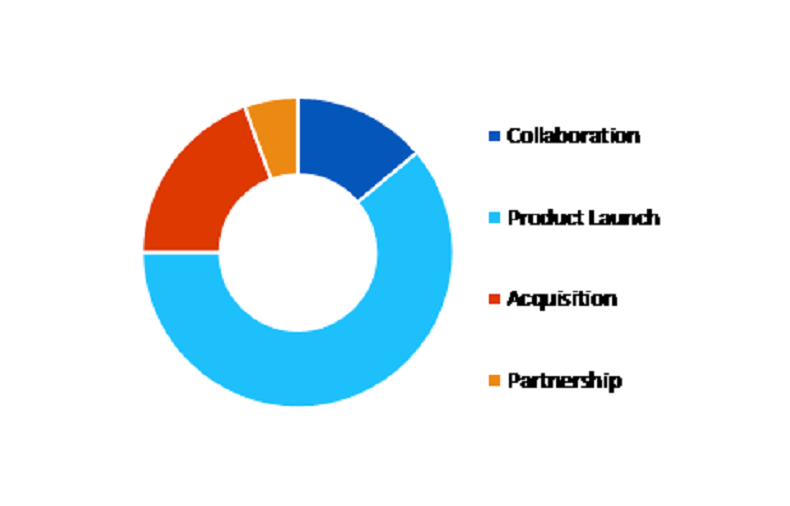 These players have expanded their market presence by adopting various business strategies such as acquisition, geographical expansion, product development, strategic alliance, and collaboration. 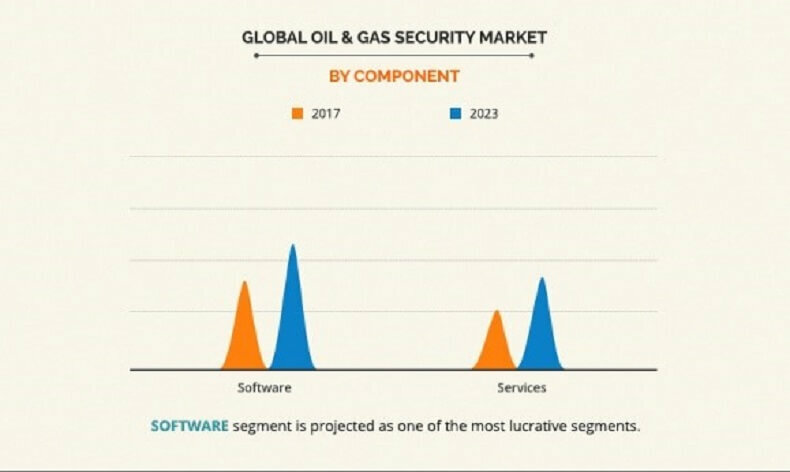 The global oil & gas security market is segmented based on component, security system, application, and region. Based on component, the market is bifurcated into software and services. Services segment is further studied across professional and managed services. Based on security system, the market is divided into cyber security, security services, command & control, screening & detection, surveillance, access control, and perimeter security. By application, it is segmented into exploring and drilling, transportation, pipelines, distribution and retail services, and others. Further, the oil & gas security market is analyzed across North America, Europe, Asia-Pacific, and LAMEA. Acquisition: This move is adopted by companies to take ownership stakes of other companies and control it. It also expands the geographical presence. The rise in trend toward enterprise mobility in the oil & gas sector increases the vulnerability of sensitive information and concerns of identity theft. Further, enterprises are facing huge challenges owing to the large amount of data generated on a daily basis. The need to efficiently manage critical data in the oil & gas sector encourages the enterprises to adopt effective security solutions. Further, the proliferation of mobile devices and smartphones within the oil & gas sector has increased as it helps improve operational efficiency as well as real-time decision-making capabilities. However, managing several devices in this environment is quite challenging for enterprises, and hence there is a need for an efficient security solution such as video surveillance, access control, and intrusion detection solutions. The increase in digitization in the oil & gas industry is giving rise to cyber-attacks such as denial of service, malware, and phishing. Globally, cyber-attacks in the oil & gas sector have caused massive disruptions to the entire network including upstream, midstream, and downstream processes. Further, the various types of cyber-attacks such as insider misuse, cyber espionage, web application attacks, denial of service, physical risk/loss of property, and payment card skimmers have affected the oil & gas industry Most enterprises are implementing effective security solutions such as intrusion prevention, access control, and incident response to combat them. Most enterprises are deploying software on cloud, which poses a high risk to the data stored in the oil & gas industry. Even though the benefits of deploying the software on cloud is high, there are security issues linked to this deployment model. Cloud model is entirely dependent on the internet and therefore is prone to outages and service interruptions at any time. In a Software-as-a-Service (SaaS) model of a cloud environment, the end users use the services provided by the cloud providers without knowing accurately where the resources for such services are located. The Middle Eastern region is generously endowed with oil & gas resources. At the end of 2001, the Middle East and North Africa (MENA) region accounted for about 69 percent of 1,050 billion barrels of the established petroleum reserves. The US$25 billion Saudi Gas Initiative, which aimed to integrate upstream gas development with downstream petrochemicals and power generation is expected to raise the Middle Eastern gas output within the coming years. Shell Exploration & Production (E&P) is also serving a regional boom in upstream activity, with major ongoing projects in Saudi Arabia, Oman, Egypt, Qatar, Kuwait, Libya, and Syria. In-depth analysis of the global oil & gas security market along with its dynamics is provided to understand the market scenario. Porter’s Five Forces analysis examines the competitive structure of the oil & gas security industry and provides a clear understanding of the factors that influence the market entry and expansion. Profile analysis of leading players that operate in the oil & gas security market are provided in the report, which highlight the major developmental strategies such as mergers & acquisitions, expansions, and new product launches adopted by these companies. Oil & gas security market is expected to witness significant growth opportunities in near future. The oil & gas companies are anticipated to invest profoundly in cybersecurity solutions and services due to frequent attacks on energy facilities. The Middle East and North America oil & gas operations are in intense need of advanced security solutions. 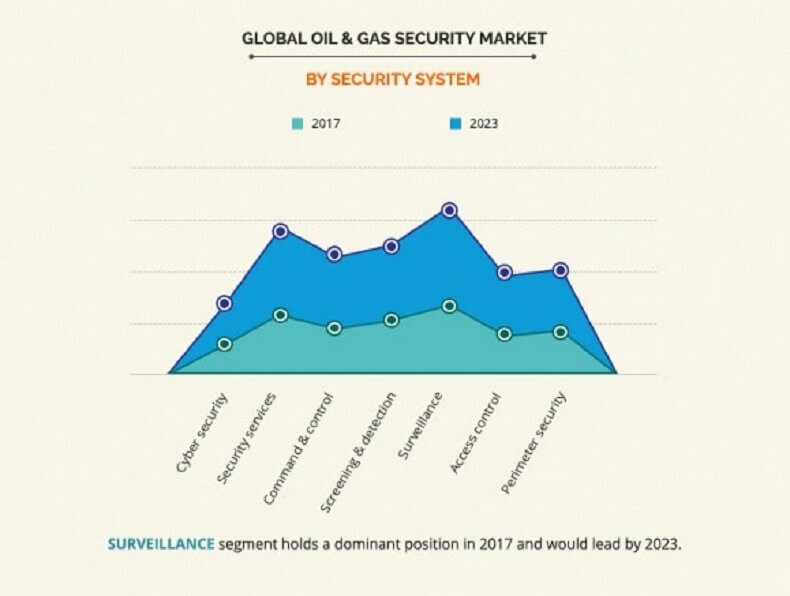 Surveillance security market dominated the global oil & gas security market; while integrated command and control solutions are expected to grow at the highest growth rate to limit maintenance and operations costs. Moreover, increase in demand for security consultant services for conducting risk and threat assessment and implementation services for leak detection and pipelining monitoring for oil & gas distribution networks is projected to boost the market growth. Surveillance segment dominates during the analysis period, while command control segment is anticipated to grow at the highest CAGR from 2017 to 2023. Surveillance includes radars, sonar, unmanned aerial systems, IP-based cameras, infrared cameras, video motion detection, and video content analysis. 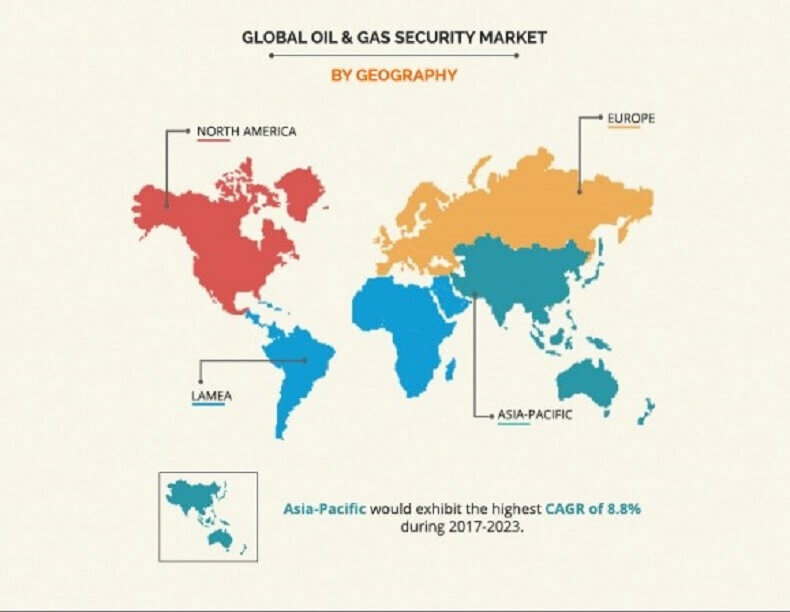 The key market players in the oil & gas security market have adopted various strategies, such as product launches, partnerships, business expansions, promotional activities, and strategic alliances, to increase awareness about newer technologies and increase their adoption across various verticals. "Oil & Gas Security Market"